Superintendent in this Southern Railway Recruitment 2018. Candidate's selection is based on screening test of 50 marks. Eligible candidates can apply online for this Southern Railway Lab Assistant, Health Malaria Inspector Jobs through rrcmas.in website on or before 27-08-2018. Candidates can apply only for one category. Applying for multiple posts is not allowed. 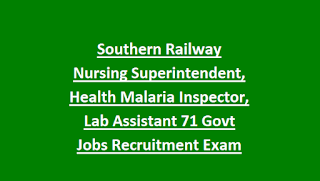 For more details regarding this Southern Railway Recruitment of Lab Assistant, Health Malaria Inspector and Nursing Superintendent jobs information is given below. Admit Card released date for written exam date will be announced in due course. For district wise and Category wise vacancies refer official website. For Nursing Superintendent age limits are 20-40 years. For ECG Technician, Lab Assistant, Radiographer, Health & Malaria Inspector 18-33 years. For Extension Educator 22-35 years. For Hemo Dialysis Technician 20-33 years. Candidates selection is based on written exam only. Written exam will be conducted for 50 marks. Exam syllabus is based on their qualification. 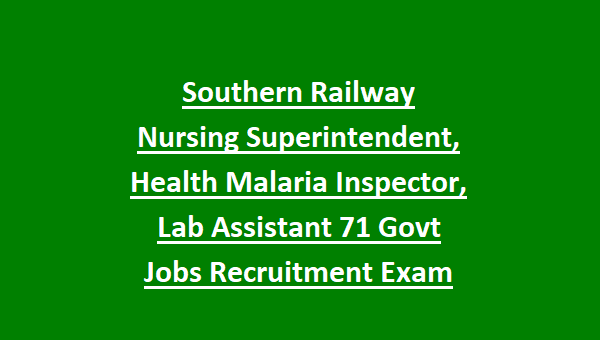 Apply online for this RRC Chennai Southern Railway Jobs Recruitment of Lab Assistant, Nursing Superintendent and Health Malaria Inspector Posts. Online applications submission last date is 27-08-2018 through official website of Southern Railway @ www.rrcmas.in.